Threshold is a village in the foothills of the Black Peaks. Generations ago, it was a prosperous town where merchants, Halfling farmers, and even Elves would come to trade with the Dwarves. But three hundred years ago the Dragon Army swept over the Black Peaks, looted Threshold and left it in ruins. Recently, however, the Dragon was defeated, and Lord Stefan has claimed Threshold as part of his territory. 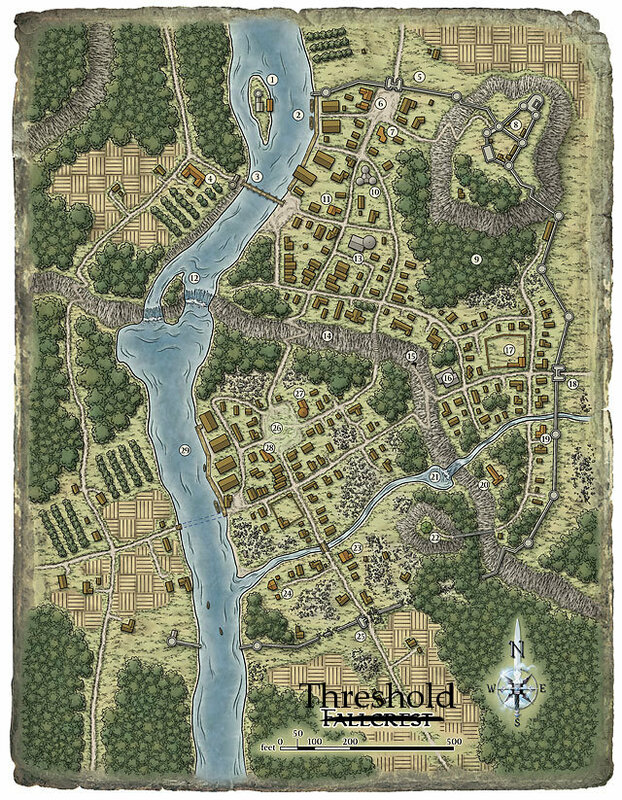 Today Threshold has the population of a small village amid the ruins of a much larger town. Mercenaries and soldiers from the recent battle throng the streets, however, and many adventurers are flocking to the place, drawn by rumors of Dwarven craftwork and the Dragon's hoard hidden somewhere in the mountains. Carousing in Threshold costs 1d6 x 100gp, and nets you the same in experience. If you do not have the full amount available, you are in debt to the local moneylenders, who charge 100% compound interest per adventure. After spending the money, you must make a save vs. mishap throw, based on a saving throw score of the DM's choice. Carousing takes place entirely on the wiki. Finn, Flann, and Fazoom, three brothers from the desert. Marwick, a soldier who avoids other soldiers and authority figures. Non-union. Kalgar Ilfrak, a dwarf with a large crossbow. Non-union. The inhabited, safe part of town is the area around the square at (26) bounded by the street to the south, the forest/cliffs to the north/east and the river to the west. Mog and Merkin (27), the town's first tavern & inn. L'Oeuf Vert (28), another tavern. Hireling Hall, a hostel for newcomers and prospective adventurers. East Gate (18), a pair of ruined towers. Goblin Castle (8), a former stronghold of the Dragon Army. Mikko's Farm (17), home of the Mikko the Dwarven Hero. Old Dwarven Warehouse (29), now the command post of Belrain the Sword-Singer. South Gate (25), headquarters of The Dead Gentlemen, a mercenary company. An iron tower (22), one of several in the region.